This is one of those records that I like to describe as a "grower"; the first few times I heard it, I thought it was good, but it didn't completely grab me. 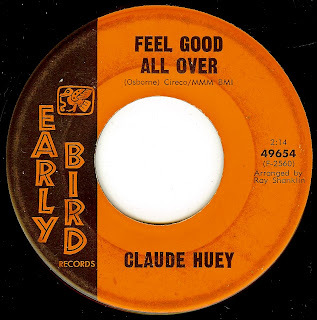 However, the more I've listened to it, the subtlety of the song and the earthy, direct vocals of San Francisco's Claude Huey have completely won me over. Everything about this record is REAL; the bare bones production, the pitch perfect female backing vocals, and the sweet sentiment of the song. The "Osborne" listed as the writer is Jesse Osborne, aka Ozz of Ozz & The Sperlings legend (his "Can You Qualify b/w Daddy Rollin' Stone" is probably my all time fave bay area soul 45). Ozz helped Claude (a lifelong pal) begin a career in music after Claude's time in the Air Force. He released 5 singles before calling it quits in 1970.